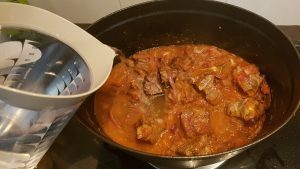 Last weekend I picked up some decent-looking lamb cubes from Tesco, and decided to use it immediately for dinner that night. I didn’t want to make something too complicated, because I was just so exhausted by the many things that were going on both at home and at work. Since Saudi Food Eman is my current go-to for yummy recipes, I naturally looked through her channel for ideas. 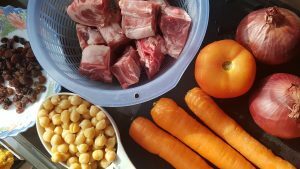 This lamb bukhari recipe doesn’t use many fancy spices; just cumin and rock salt. What I found super elegant about this recipe is that it is all about building layers of natural flavor from the ingredients. 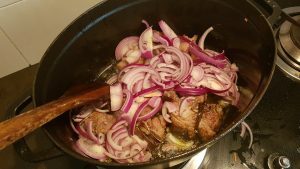 So take your time, caramelize those onions, simmer the lamb until the oil separates. The result is a beautifully fluffy bukhari which is simply delicious. Based on Eman’s recipe here. 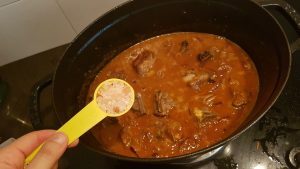 I used more lamb and a bit more salt in mine, and added more precise measurements for the ingredients. Enjoy! 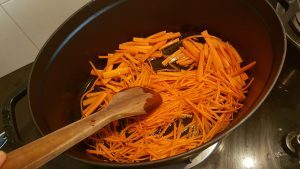 Add the carrots cook and cook, stirring frequently, 3 minutes. Add the raisins and cook, stirring, for another 2 minutes. 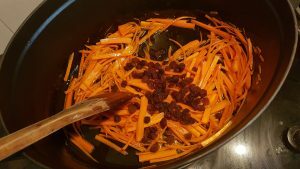 Remove the carrots and raisins from the pot and set aside. 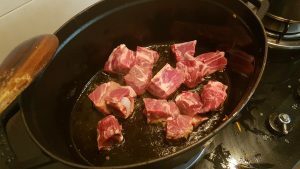 In the same pot, add the lamb and cook, until browned on all sides, about 3 minutes per side. 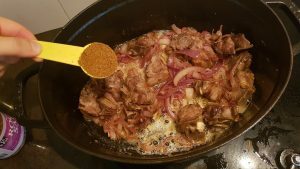 Add the onions and cook, stirring occasionally, until onions are caramelized. This is very important to build the layers of flavor. 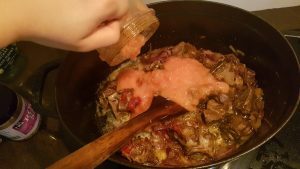 …tomato paste and pureed tomatoes. 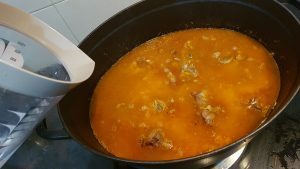 Cook until the oil separates to the surface of the mixture. 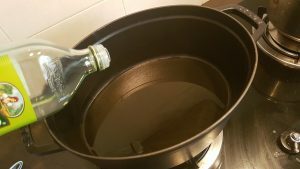 Add the salt, and bring to a boil. Cover and cook undisturbed, about 1 hour. 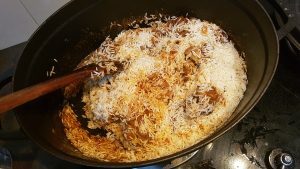 After about 1 hour, add the rice and gently stir to combine. 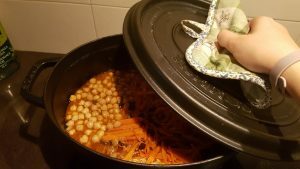 Add enough water to cover the rice by no more than 1 inch. Cook uncovered until the rice starts to become visible. 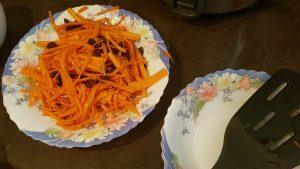 Arrange the carrots and raisins in a layer on top of the rice, followed by the chick peas. Lower the heat. Cover and cook undisturbed, until all the liquid has evaporated and rice is cooked and fluffy, about 30 minutes. 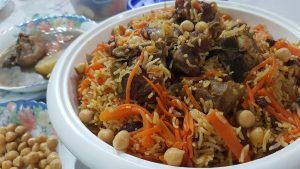 Spoon the rice onto a large serving platter, and arrange the lamb pieces in the center. 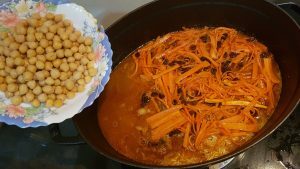 Scatter the carrots, raisins and chick peas around the meat. Serve warm.